If you have an unwanted swarm of bees on your property, please call one of our local beekeepers. 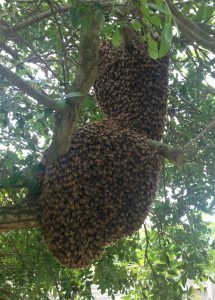 We can inspect the swarm and remove it safely to a hive where the bees will have a chance to flourish. Please note: If the beekeeper is not immediately available, leave a message and they will call you back as soon as possible. Please try to work with only one beekeeper at a time, but if you call more than one, let them know that you’ve contacted other beekeepers as well, and who you’ve contacted. It helps prevent long drives to a swarm that has already been caught. Are there still lots of bees in the air? Is it in a public place? 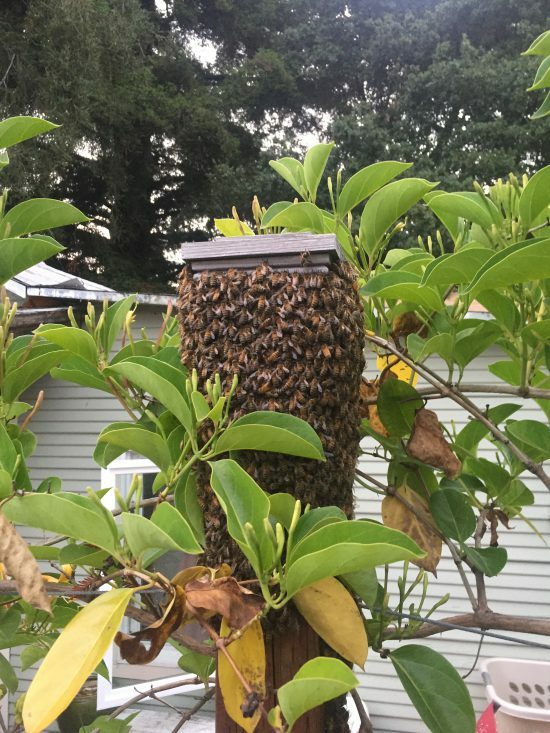 A small swarm on a fence post. Removing a swarm of bees from a tree or the outside of a building is relatively simple. However, if bees have taken up residence inside a wall or roof, the extraction procedure becomes much more complex and usually involves cutting into the wall to remove bees and comb. This may require re-construction after the extraction is complete. A beekeeper working on an extraction will also sometimes need to make multiple visits to the property to ensure that all bees have been captured. Many beekeepers will capture a swarm for free, however, that should be discussed with the beekeeper beforehand. Extraction of a colony from walls or other space usually involves a fee, as it takes much more effort and time on the part of the beekeeper. Discuss this fee with your beekeeper before you engage him/her, and also discuss whether that fee includes reconstruction.